All of our new chairs have hardwood frames designed to last a lifetime. Relax in ultimate comfort in a beautifully upholstered new chair. 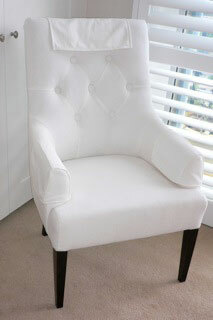 There is nothing more relaxing than sitting in a tailored new armchair. We have many styles and can alter depth, height and firmness to your liking. If you want a chair with full head and back support you can't go past a wing chair. Called a lug chair in old English (lug meaning ear), chaise joues in French (cheek) they were originally meant for around the fireplace to keep the chill from the occupant. Do you remember when dining chairs used to have springs in the seat ? Ours still do. Sit for hours at the table in pure comfort. A great range of new chairs for the bedroom, hallway or desk. 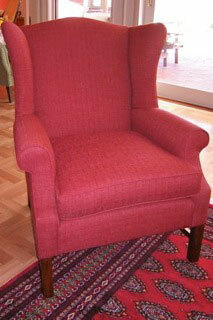 If you haven't got the space for a large armchair why not fill it with an occasional chair.